Celebrating 60 years of business ! 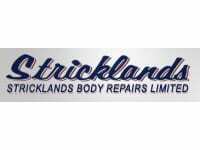 If you are in need of accident repairs in Hampshire or a body shop in Hampshire then make Sticklands Body Repairs Ltd your first choice and give us a call today. "YOU HAVE THE RIGHT TO CHOOSE YOUR REPAIRER"
Quality and Service have always been the main objective of our business. Established in 1957 we are a family run business which has grown over the years but still have not forgotten the personal touch is a value we pride ourselves in providing to each individual commercial or domestic customer. We boast an efficient, reliable, quality reputation in Southampton and thesurrounding area in which we serve. Give us a call today and we will be happy to discuss your requirements.